Red Hill Farms is a leading Red Angus & Simmental genetics supplier. They raise quality cattle, swine and tobacco in northern middle Tennessee and south central Kentucky. Their mission is to be good stewards of the land, promote excellent husbandry practices, treat animals with respect, give back to the community, and provide superior genetic products to increase customer profitability and enhance consumer appeal of U.S. beef and pork. 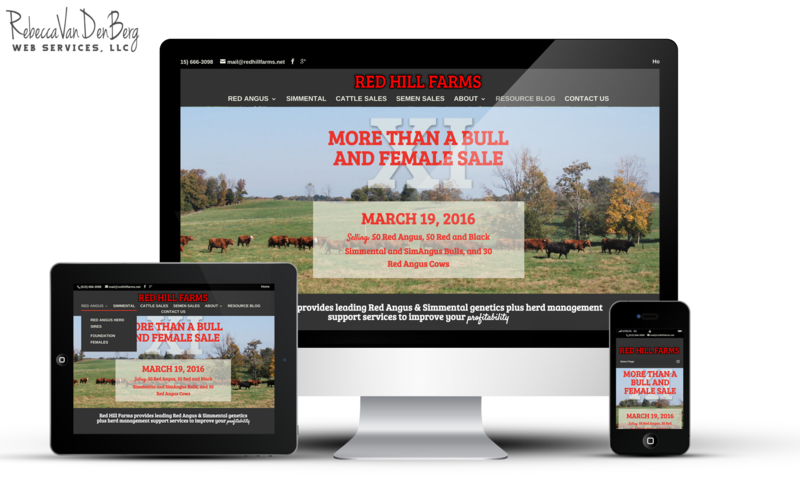 We at RVWS created a brand new website for Red Hill Farms, that effectively shows the three main focuses of their company: cattle, swine and tobacco. The major part of their business is the Red Angus and Simmental cattle. They hold annual sales in the spring and fall. The goal of the website was to create an effective way to promote the sale, keep customers updated on the latest news, create an educational blog, and provide an easy to read layout for customers to review their sire pedigrees. Creating the pages to display the Red Angus and Simmental EPD’s similar to how each breed association presents them on a performance pedigree, created a challenge. Large amounts of data in table format does not display well on a mobile device, it just doesn’t fit. RVWS was able to work through a series of potential layouts that met the needs of the client by keeping the data in the same layout as the pedigrees and modified to a readable layout on a mobile device. Since Red Hill Farms is keeping up with technologies and is progressively minded, they were already successfully using Facebook to engage with their customers. It was important for them to share these regular updates on the website and RVWS created custom Facebook Feed Integration for their home page. Other integrations you will find on this site include a custom newsletter sign-up tied directly with their sending service, and embedded YouTube videos of customer testimonials.